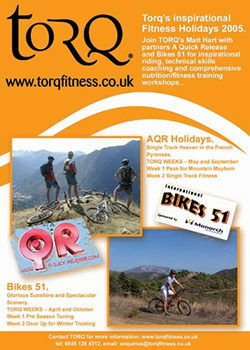 This is our itinerary for the first fitness week in Spain, running from 28th March to 4th April 2005. If you can’t get a place on this one, worry not, we’ll be running 3 further very similar weeks in 2005. For general information and dates, click here. Arrival times will vary, so there will be no set agenda for the first day. There will be an informal meeting in the hotel in the evening, where introductions will be made and the itinerary for the week will be discussed in more detail. You will have the option to partake in a fitness test if you so desire at the hugely discounted rate of £25. This needs to be carried out early in the week when you’re well rested or you simply won’t perform. Fitness testing is optional, so depending on demand; the structure of the day will be adjusted accordingly. If you want a fitness test, you will be provided with either an AM or PM time slot. In the morning and afternoon, International Bikes 51 will be leading you on a casual spin around the local forest trails – nothing too taxing – the aim being to hone in on your technical weaknesses and discuss/work on them. You’ll have a whole week to discuss these with us and the other riders, but it’s always a good idea to put your major gremlins to bed on the first day in the hope that they don’t wake up for the entire holiday! If you don’t want a fitness test, it looks like you’ll have plenty of opportunity to work on your technique and enjoy the Spanish sunshine. There’s a pool at the hotel, so you might even want to take a dip? This first day is kept deliberately light, so don’t be tempted to push it too hard – you’ve got a big day tomorrow. Intl. Bikes 51 have been briefed to provide us with a whopper of a climb to conquer in the morning. This should take between 1.5 and 2.5 hours to climb, depending on your ability. 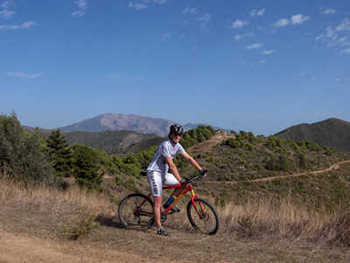 You’ll be encouraged to ride at your own pace (as hard as you can), which means we’ll all be gathering at the top to admire the stunning views of the mountains and the coast – you may even see the African coast. We won’t be in a rush to head-off, so you’ll have plenty of time to recover. We’ll then descend into the white village of Monda for lunch and head back to the hotel via fire road trails in the afternoon. And in the evening: Optional Seminar 2. Performance Nutrition and Supplementation. The objective of day 4 is to get some hours under our belts. The emphasis is taken away from intensity and more towards ‘getting the miles in’. We’ll be riding in the Alhaurin el Grande forests, which offer a combination of technical climbs, descents, firetrack and singletrack. We’ll split into 2 groups if necessary, with a faster group covering a slightly larger loop before meeting up for lunch. We’ll do a similar thing in the afternoon. You’ll be encouraged to take on as much volume as you can – you’ve got to earn your rest day tomorrow? And in the evening: Optional Seminar 3. Pedaling Dynamics and Trail Technique. A day off…well, almost! Today’s objective is to go out, enjoy the trails and focus on improving the technical aspects of your riding – putting into practice the discussion points from the previous evening’s seminar. The riding won’t be hard and we’ll be spending time practicing specific sections of trail to help build you into a better technical rider. We’ll be back at the hotel for lunch and an afternoon swimming and relaxing by the pool. And later in the afternoon: Optional Seminar 4. Periodization and Peaking. 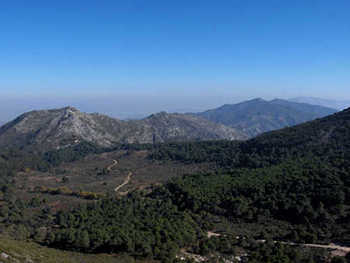 In the morning we’ll ride up to Coin woods which houses one of the Spanish National Mountain Bike courses with its technical single track, short sharp climbs and descents linked with fireroad. There are a few longer climbs but lots of fun descents too. We’ll have a course marked out for you and you’ll be prescribed a number of laps (dependent on ability and fitness objectives). Your aim will be to ride your prescribed laps as quickly (and safely) as possible. After this, we’ll trundle off for some lunch and spend the afternoon riding leisurely, winding along some more inspiring trails. Again, this is an opportunity to address your technique issues. And in the evening: Optional Seminar 5. Training with Heart Rate or Power? Let’s see what you’ve got left in the tank? You’ll be throwing your bike in the Intl. Bikes 51 trailer and jumping in the 4×4, which will transfer us to the beautiful white village of Ojen. 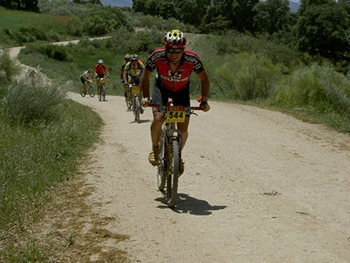 Two BH-Sierra Nevada professionals live and train in Ojen, Jose Marquez, the 2003 Spanish National XC Champ and Antonio Ortiz, winner of the 2004 Spanish National series; both accomplished international riders. We’ll ride the hills around the village on two large loops with lunch in Ojen itself. You’ll be riding lots of long tough climbs and technical rocky descents, which will test your bike handling skills. As with Day 4, there will be plenty of opportunity for the stronger riders to cover a greater distance. And in the evening: Optional Seminar 6. Summing-up and Evaluation.